If the headline above is causing you to send a side-eye in my general direction, hopefully the following will help explain things: basically, in the last few months, I've acquired a whole slew of Taiko no Tatsujin games. Specifically, I've acquired five of them. I started with the initial Taiko no Tatsujin DS title, as some of you may remember, and it so pleased me that I quickly ran out (or ran to various places on the Internet) and bought the second and third Taiko no Tatsujin DS releases as well as the first to hit the 3DS. A month or so later, I added the third PSP iteration, called Taiko no Tatsujin Portable DX, to my ever-growing collection. Given all of the above, it should come as no surprise to hear that the recent announcement that a Taiko no Tatsujin title was being prepped for the Vita prompted me to bellow with delight. As for when Taiko no Tatsujin V Version will hit the streets in Japan, how much it'll cost and all that jazz: the game's release date is July 9 and the price tag attached to it at that time will be 5,690 yen. Oh, and according to sources like gematsu.com and neogaf.com, it'll feature 80 songs and an RPG-esque mode called "Donda Quest." If all of that sounds swell to you, and if you've got a Vita and some cash to blow, you can pre-order this sucker right now via amiami.com for just 5,200 yen (about $44). I've always wanted to jump into this series. It looks simple enough to play, and doesn't seem to require much knowledge of the Japanese language. Vita also means region free, so that makes it a bit more import friendly. Though, Namco has been on a roll with localization announcements lately too. I wonder if they'd consider bringing it over as digital only release. Based on my experience with Taiko no Tatsujin DS, Inganno, I can assure you that you don't need to understand Japanese to enjoy these games. Sure, some of the side or challenge or quest modes and such may be tough to complete if you don't know a lick of the language, but everyone should be able to make their way through the main mode. As for this game's chances RE: localization: sadly, I wouldn't bet on it. 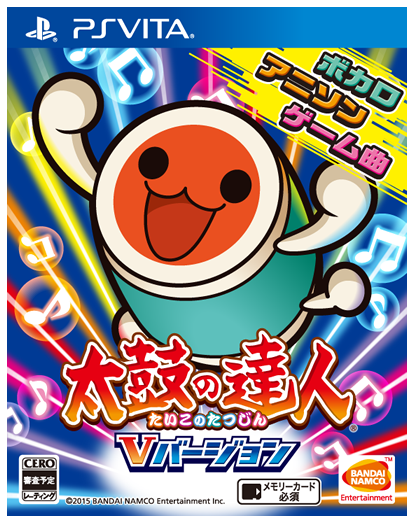 Namco's brought exactly ONE of the 20+ Taiko titles it's released for Japanese consoles and handhelds over the years to western regions, and that one release happened all the way back in the PS2 era. I'd welcome a NA release of this game with open arms, of course, but I'm also not going to hold my breath waiting for it to happen. Wow, the fact we ever got one is pretty cool. Yep, it was called Taiko Drum Master (for PS2) and it came with a drum controller. It had a soundtrack that featured some unique (American/English) tunes for the series, too, I believe. Not gonna lie, I was looking at Vita prices the other day. I think it's all because I saw a PSP at Half Price Books for $50 and the thought of having a PS handheld sort of stuck with me. This would be a sweet addition. Well, Justin, you know I'm never going to try to sway anyone away from picking up a PSP, a Vita or both. To be honest, though, you may be better off picking up that $50 PSP, if it's in acceptable condition. Really, it depends on what you want out of a Portable PlayStation. If you're OK with sticking to "old" and/or already released games (PSP UMDs, digital versions of those UMDs, PSI classics and a few other PSN releases), you'll probably get a lot of enjoyment out of the PSP. Plus, many PSP games are dirt cheap these days. On the other hand, if you'd prefer something newer, that's less clunky (the controls are better on the Vita than the PSP), is more focused on digital games, etc., you may want to go with the Vita, although of course you'll pay more for its hardware and software than you will for a PSP and PSP games. I'm currently loving both and I'm glad I have both, but if I were forced to choose one over the other I'd probably go with the PSP, even with its control issues. Really tempted to pick this one up, but I've never played a portable version. On something like the Vita does it play with the touchscreen, buttons, or user selectable?